Investors have turned a thumbs down on the proposed acquisition of Celgene as there was an immediate 14% plunge in the stock price of BMY to $45. Investors are concerned about the patent situation with Celgene’s Revlimid which represents about 64% of CELG sales. The key patent protection on Revlimid expires in 2027, but complex and difficult to predict (let alone quantify) settlements with generic competitors could lead to generic entries in the 2022 to 2024 period. The expectation of the ‘Street” is that this will lead to a gradual erosion of Revlimid sales in the 2022 to 2027 period followed by a sharp plunge after 2027. BMY certainly understands the implications of the Revlimid patent expiration and did not blithely take on this albatross. They say that they have modeled the sales erosion for Revlimid in a number of ways and state that their working projections assume more loss of Revlimid sales than the Street consensus. They have just released their projections for combined operations of Bristol-Myers and Celgene through 2025 and this is the reason for this report. However, they did not give specific assumptions on sales of Revlimid or other key products of the company. BMY management has made crystal clear that this acquisition was all about the research pipeline of the companies; there was particular emphasis on cell therapies in which CELG has built a leading position. They believe cell therapy has the potential to be the next driving force in biopharma drug development over coming decades and to become as important as monoclonal antibodies are today. Clearly, it believes the pipeline potential justifies taking on the Revlimid burden. BMY has already built a leadership position in immune-oncology which is probably the most exciting, current commercial opportunity in biopharma. This is based on the checkpoint inhibitors Opdivo and Yervoy and a broad pipeline of other agents. Bristol-Myers and Merck are the two clear leaders at present. In cellular therapy, Celgene, Novartis and Gilead are the clear leaders. In my opinion, BMY when combined with Celgene is a strong contender for being the best of the biopharma companies (includes multinational pharmaceutical and the largest biotechnology companies). If so, it could be the best commercially performing biopharma company in coming decades. The market does not share my view. Based on projections just released by BMY that include Celgene, the company is selling at 10.9 times 2019 EPS which is a 26% discount to the S&P 500. 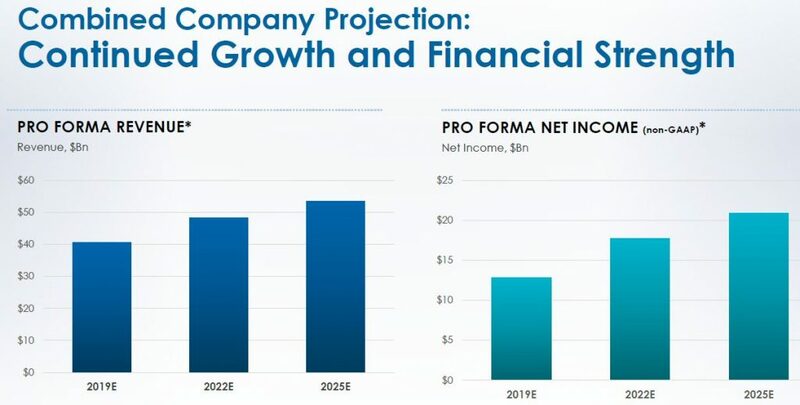 BMY is estimating that over the period 2019 to 2025, earnings will increase at 9% per annum which compares to about 5% that is the most common projection for the S&P 500. BMY also has a dividend yield of 3.3% versus 1.9% for the S&P 500. In my opinion, this is a premier innovative company with an exceptional outlook over the next few decades regardless of what happens to Revlimid that is priced like a mature company with poor growth prospects. I think BMY is a compelling purchase for both value and growth investors. Aside from this paradigm changing, proposed acquisition of Celgene, investors are awaiting the results from BMY’s all-important 2,700 patient CHECKPOINT-227 trial that will define the role of Opdivo, Opdivo combined with Yervoy, and Opdivo combined with chemotherapy in first line non-small cell lung cancer. If results are positive, this could catapult BMY back into the lead in non-small cell lung cancer, a place that it lost to Merck in 2018. Results will be very important to the immediate stock price. This trial is event driven so that the timing of results is difficult to predict but they should be reported at some point in 2019. On a final point, if we think of Revlimid sales as representing a franchise in treating certain multiple myeloma patients, this franchise may be maintained in a number of ways such as developing new drugs or though combinations with other drugs. It could be the case that Revlimid sales could virtually disappear and yet the current sales being generated by Revlimid in its current indications are maintained. Bristol Myers Squibb just issued guidance for combined sales and earnings if the Celgene acquisition is consummated. The guidance was issued in the form of a slide as shown below without precise numbers so we have to eyeball the slide to arrive at numbers. Also, BMY ended the year with 2,018 million fully diluted shares and will issue 720 million says under terms of the proposed merger so that outstanding shares will rise to 2,738 million shares. The next table provides numerical estimates based on eyeballing this slide. I have then calculated the compounded annual growth rate for projected sales, net income and EPS for the three periods. The period from 2022 to 2025 reflects the beginning of generic competition to Revlimid. BMY has not broken out assumptions for Revlimid in the period 2019 to 2025 other than saying that they are using estimates below those of Street analysts which show a gradual erosion. I expect Revlimid sales to be de minimis in the period beyond 2027. Please refer to the following table. I take the sales and net income projections with a grain of salt as I don’t think any company can really project results with any meaningful accuracy six years into the future. There will be a number of upside and downside surprises along the way. My guess is that the bias will be to the upside, but obviously this is a hunch.